FAQ – What is Messianic Judaism? Messianic Judaism is a movement of Jews and supportive Gentiles who believe that Yeshua (Jesus in Hebrew) is the promised Messiah of Israel, descended from King David, and Savior of all who put their trust in Him. Just as Yeshua read from a scroll of Hebrew Scri ptures on Shabbat (Sabbath) in a Synagogue (Luke 4:17-20), so we read from a Torah scroll in our Synagogue on Shabbat. Just as Yeshua and His disciples observed the biblical festivals and observed Torah and Jewish customs (see Acts), so we observe the festivals of Israel, keep biblical kashrut (Leviticus 11), wear tallit (prayer shawls) with tzitzit (fringes), etc. Just as Yeshua and the disciples went first to the sheep of Israel, so we pray for the peace of Jerusalem and share the Good News of Yeshua “to the Jew first, and also the Gentile” (Romans 1:16). Why is Messianic Judaism biblical and not a modern cult? The original, first century Yeshua movement was entirely Jewish. Yeshua’s Jewish disciples first told other Jews about Yeshua, with signs and wonders. After many years, they started telling their Gentile neighbors, including “God-fearers” who also attended Synagogues (see Acts). After the destruction of the Temple, the Yeshua movement was forced out of Jerusalem, and became predominantly Gentile and even anti-Jewish. Yet communities of Jewish believers in Yeshua persevered until the Moslem conquest in the 7th century. The modern Messianic Jewish movement began shortly after the re-unification of Jerusalem in 1967, during a time of spiritual ferment in America. 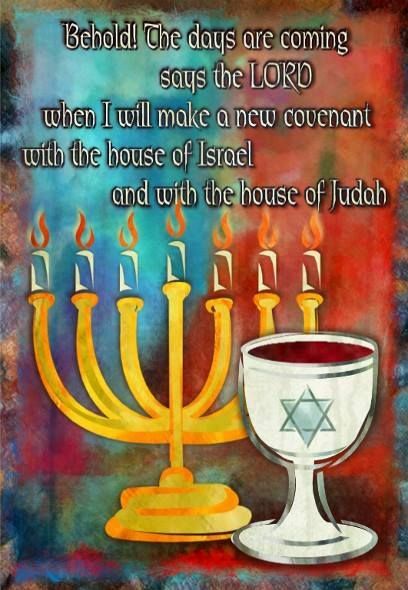 Just as the physical restoration of Jews to the land of Israel is a fulfillment of many prophecies (such as Ezekiel 36:8-12), so is the spiritual restoration of Messianic Jewish communities (Ezekiel 36:24-26). Jeremiah foretold the making of a New Covenant with Israel. Because our people had been unfaithful to the covenant of Moses (just as foretold), God promised to give them a new covenant, written on their hearts rather than stone, and to forgive their sins forever. That’s what Yeshua did, by making a New Covenant, sealed by His sacrificial death, making atonement for all our sins, once for all (Hebrews 9). Just as traditional Jews await the coming of Messiah, so Messianic believers await the return of Messiah Yeshua, who will reign in Jerusalem over Israel and all the nations of the world, when all will beat their swords in plowshares and their spears into pruning shears (Isaiah 2). 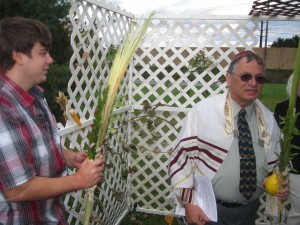 Moreover, Beit Simcha is affiliated with and accountable to the Tikkun America network of Messianic congregations (see also Tikkun Global Messianic Family) as well as the International Alliance of Messianic Congregations and Synagogues (IAMCS), from which Rabbi Blank received his s’micha (ordination). If you believe that Yeshua is the Messiah, are you still Jewish? Certainly. If you are born a Jew, you will always be a Jew. For example, former Secretary of State Madeleine Albright discovered late in life that she was born Jewish. Even though she had been raised a practicing Catholic, Jewish halakhah (law) still regards her (and any of her children) as Jewish. Believing in Yeshua is very Jewish, because “Messiah” (Moshiach) is a Jewish idea, and His Jewish disciples identified Him as the Messiah. Yeshua himself was a Jew (since his mother Miriam was a Jew), he lived as a Jew, and said, “Salvation is from the Jews” (John 4:22). A Messianic Jew lives out his calling, from birth, to follow Yeshua as a Jew. Not at all. Our vision statement is “We are a community welcoming Jews and Gentiles, rejoicing, worshipping the God of Israel, learning, and loving one another.” All are welcome! Do you have to believe in Yeshua to come or can I just come and check it out? We encourage all who are interested to visit, join in as you are led, stay for oneg (lunch and fellowship after Shabbat morning service) and ask questions about what we do. Our services are lively and most people find them to be quite interesting. Our services combine traditional Jewish liturgy with Spirit-filled praise and worship. 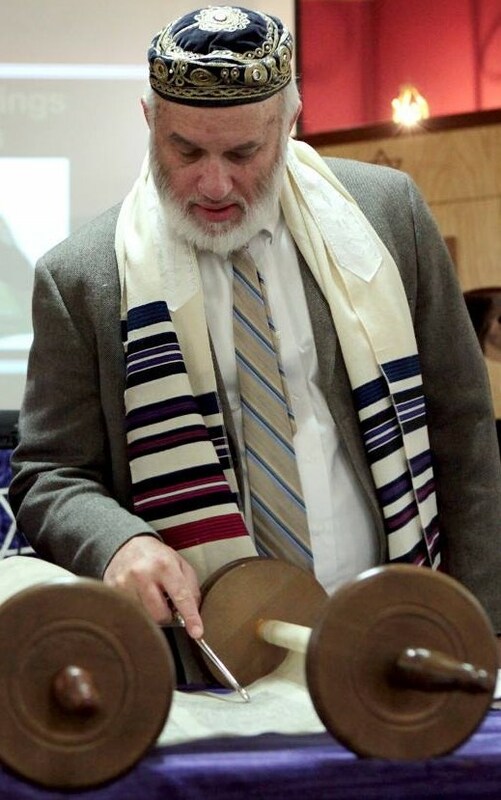 The Rabbi opens the service by praying that we might all come into His presence as he puts on a tallit or prayer shawl. Our chazzan (cantor) leads us with prayers from a siddur (prayer book). Following the example of David (see for examples Psalms 149 and 150), we praise HaShem (the Name or the Lord) with singing, clapping, circle dancing, standing, davening (bowing), and praying silently. 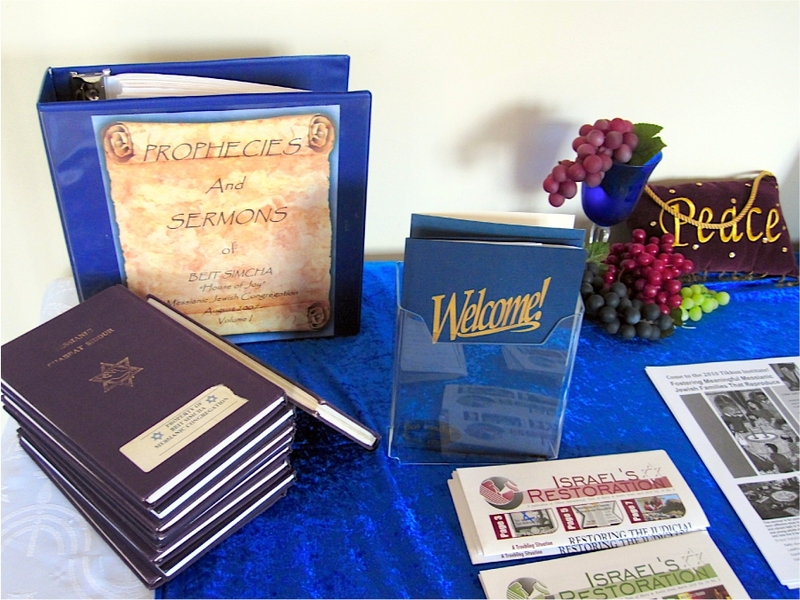 Inspired by the Ruach Elohim (Spirit of God), people may spontaneously read Scripture or share prophecies to encourage the congregation. We bless our children under a large tallit before they to to Shabbat school. People read from the Torah scroll and give short drashot (insights and applications) or our Rabbi or guest speaker gives a longer teaching. Never a dull moment! 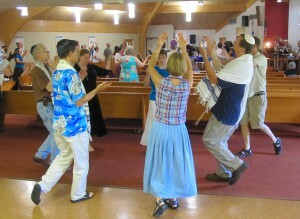 Here’s a page illustrating a Shabbat service. Where do you meet? What time are services? Our services are at Trexlertown Grange, west of Allentown, across the street from the site where we will build our new Synagogue and Community House. Click to see a map and directions. Our Shabbat services start at 10AM. We also have services for other festivals and special events at other times. We have havurah (friendship) groups and bible studies that meet in homes in Allentown, Breinigsville and Coopersburg, at other times. Call 610-289-2011 for more information. Do you keep the Biblical festivals? Yes, we observe the festivals ordained forever in Leviticus 23, including Shabbat (Sabbath, the seventh day of each week), Pesach (Passover), Bikkurim (First Fruits), Shavuot (Weeks), Yom Teruah (Day of Blowing Shofars commonly known as Rosh Hashanah), Yom Kippur (Day of Atonement) and Sukkot (Tabernacles or Booths). We also celebrate Purim (as ordained in Esther), Chanukah (Re-Dedication of the Temple), etc. Yeshua also celebrated these festivals and each of them is associated with a major event in Messiah’s plan to redeem humanity. Check out web site periodically to find out when we will be celebrating upcoming festivals and plan to join us! Is there a dress code? Do men have to wear a yarmulke? Dress in a manner that shows respect for G-d and will not distract your neighbors. The yarmulke (kippa or head covering) is a traditional way for men to show respect for HaShem. We recommend and can provide you with one at the door, but do not require wearing one. Do you read the New Testament? We study both the Hebrew Scriptures and the New Covenant or Brit Chadashah. During our services we read verses from the New Covenant declaring the character and teachings of Messiah Yeshua. The New Covenant is a very Jewish book. For example, Luke describes how Yeshua had a brit milah (circumcision), studied with the sages in the Temple, declared that the greatest commandment is the V’Ahavta (“You shall love the L-RD your G-d” from Deuteronomy 6:5), etc. Do you have a question? Email it to us or come to the Rabbi Glenn’s Bible study.